This resolution is evidence that increasing numbers of Americans, including American Jews, support equality and human rights rights for Palestinians and Israelis, and believe that accountability is an important step toward peace. 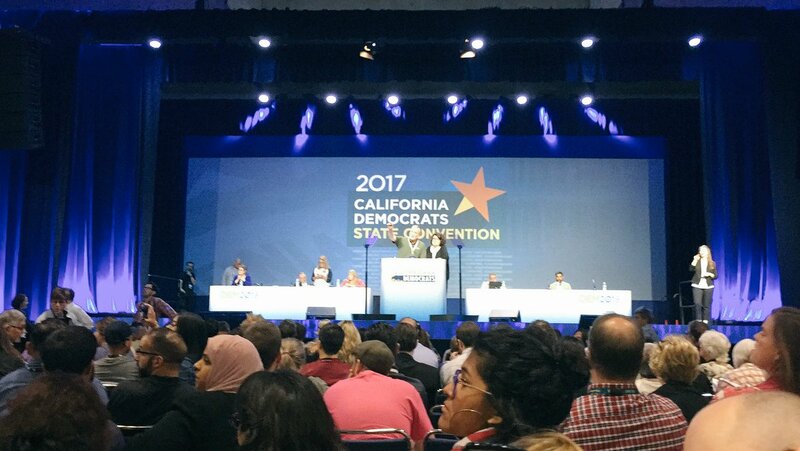 David L. Mandel, an elected convention delegate, said that diligent organizing by supporters in the weeks before the convention led to endorsement by more than 200 delegates, making it likely the resolution would have come to the floor by petition even if the Resolutions Committee had not prioritized it, which it did, unexpectedly Mandel was a primary author of the resolution, along with Karen Bernal, chair of the state party’s large Progressive Caucus, and Murad Sarama, outgoing chair of the state party’s Arab American Caucus. A final paragraph in the resolution puts the party on record as rejecting “any effort to restrict or discourage full and open public discourse” on Israel-Palestine; “disavows conflation of criticism of a country’s policies with hatred of its people”; “opposes anti-Semitic or Islamophobic language brought into the debate and any attempt to restrict or penalize those who exercise their right to express their views through nonviolent action to effect change.” This clause, Mandel explained, was directed at widespread campus persecution of Palestinian rights advocacy and at the many resolutions and bills introduced recently in Congress and state legislatures, including California’s, that aim to stigmatize, suppress and penalize – even criminally in some cases – those who seek to use boycotts or divestment campaigns to pressure Israel.